What a fantastic title of the review on my exhibition from the Glen Falls Post-Star reporter Amanda May Metzger. You can click here to access it. Thank you Amanda! The show closes this week! 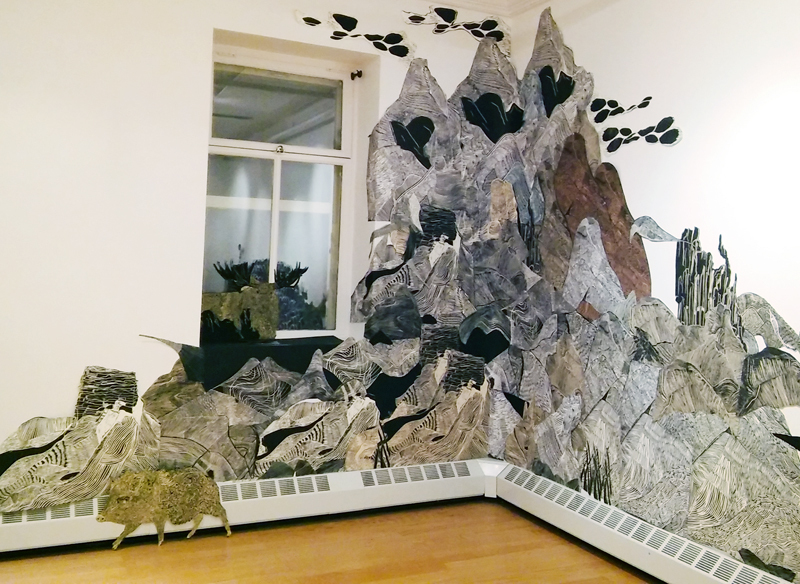 After 40 hours of pasting cut paper onto the wall, one year of carving linoleum, printing it and cutting it into pieces, all of which were preceded by 100’s of miles of mountains hiking and trail running in northern New York, New Mexico, Colorado, California, Tasmania and Cameroon the exhibition it up at Lake George Courthouse Gallery, Lake George, NY. 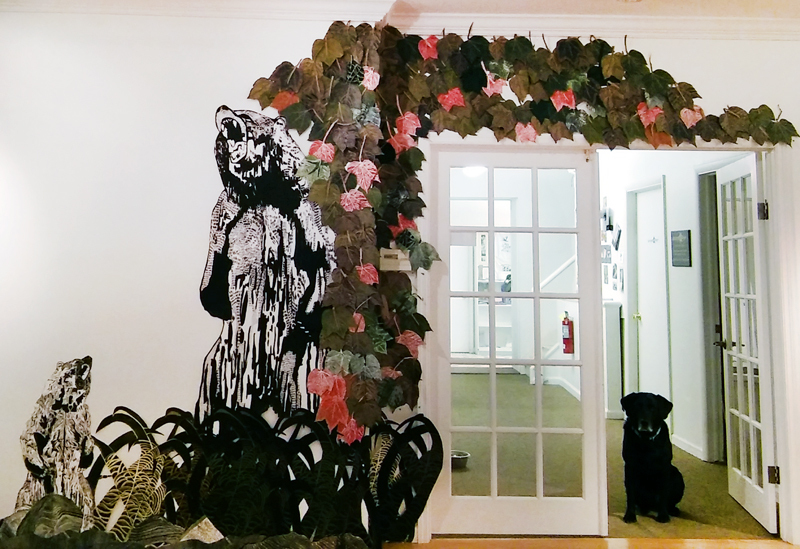 Each cut paper installation I do, is build from previous hikes or trail runs from around the world. 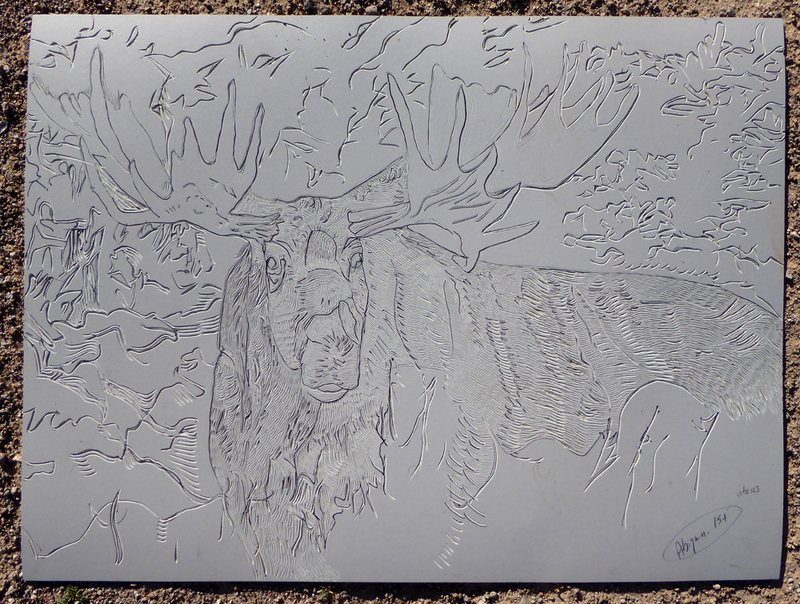 After running to the top of a particular mountain, I carve it. This keeps me fit, happy, traveling and constantly creating new work. On Saturday, Nov. 14, 2015, my exhibition opened to a great crowd. 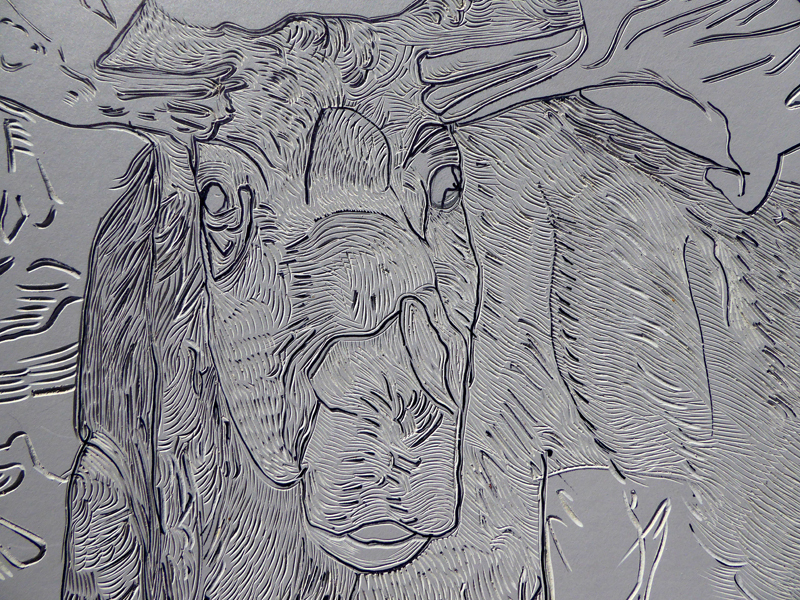 Carving animals that are unique to the region, I spent several days with my dogs in the gallery preparing for the opening on November 14, 2015. I could not have asked for a better reception. Friends drove or took the Amtrak the 200 miles from NYC, others drove 1-2 hours across the Adirondacks to get there. I was thrilled to see my number one hiking partner and good friend, ADK Nancy, pictured here with me, who made an almost 2 hour drive. We met in a lean-to on a backpack adventure. Lisa, Amy and Sally all drove up from NYC, and while it is 200 miles, depending on the weather, it can take up to 6 hours to get there, real dedication. Anyhow, they really made my night along with my family who sent flowers and all those who were at the reception including the press which is always exciting. 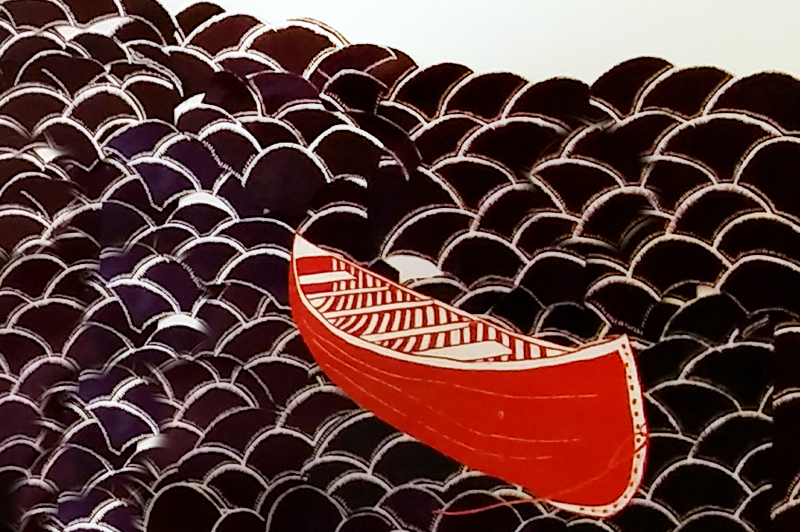 One year ago I had the great opportunity to make work for Wave Hill Public Garden and Culture Center , so to follow it up one year later adding water, boats, and new animals and mountains to the mix was a fantastic opportunity. Okay, this clown is Conrad, he is not an official animal in the exhibition. I am back in Brooklyn teaching this week, but after next Monday’s class, I will pack up the dogs, and head to Sally’s cabin for Thanksgiving Week with plans to be at the Gallery Saturday November 28. so stop on by if you are in the neighborhood or say, 200 miles! Thank goodness, last night while attempting to sleep, I could not shut my brain off after the big install day, the elves came in and fixed up the show. Frankly, I left yesterday having a lot of doubt, but when I came in this morning and the doubt went away. The framed pieces are up, thanks to Lisa B. The lean-to, leaves, clouds and more water have been added. Here is a cell phone panoramic shot. 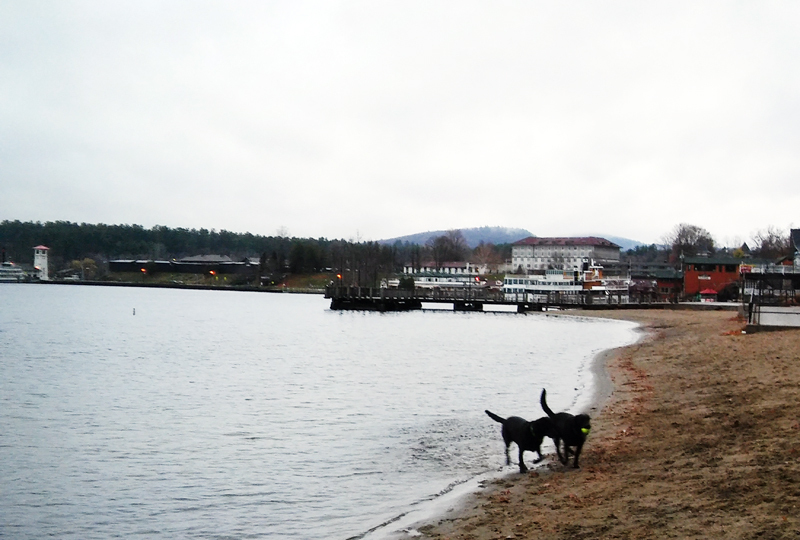 We took a coffee break right behind the gallery so that the dogs could play on the Lake George beach. They were happy and so was I. Tomorrow there is a yoga class in the gallery. I was asked if it would be okay since I was still installing and I think it is great. I am going to take the class, as my body is screaming for exercise and some stretching after all this paper cutting and ladder climbing. Hopefully by 7pm Friday night I will be able to call the show complete. Come on up to Lake George, Saturday, Nov 14th from 4-6 is the opening. 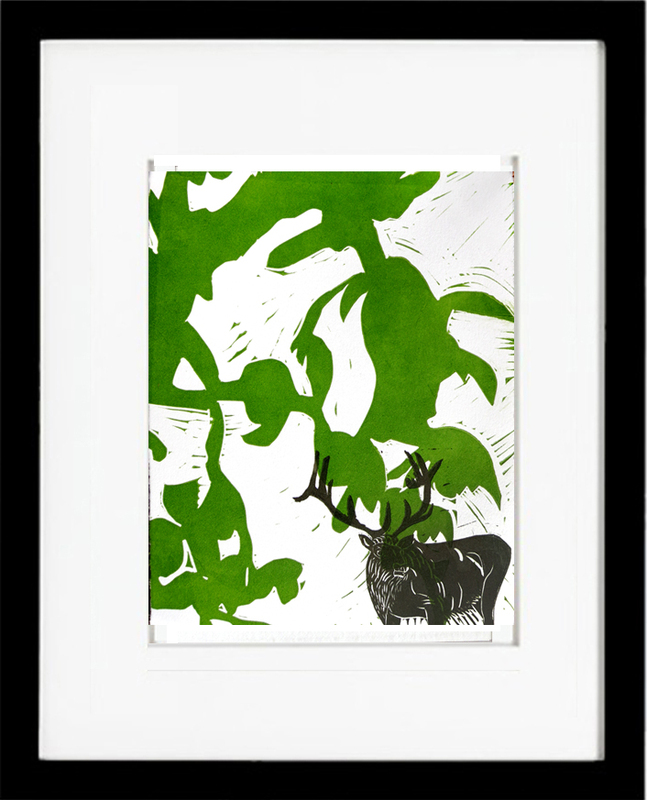 I just returned to my cute Adirondack motel room after an 11 hour day of cutting and placing linoleum block prints into an installation, I titled the show “My Own Private Wilderness”. I have 2.5 more days to complete it and I am a bit nervous. Day one is always slow but today seemed extra slow. It is the first time I am building water. I was at a loss on how the land meets the water, but thankfully Lake George is right outside the window, the beautiful mountains in the background giving me a direct reference. The photos are from my cell phone so not ideal but I will have excellent photos with my good camera soon. The title of my show refers to my wilderness fantasy. Living in NYC I often feel removed from nature, and I am a person who loves backpacking, loves hiking in the mountains. My ideal would be living in the mountains full-time. But until then I create my own fantasy. The exhibition opens on Saturday, November 14 at 4pm. The gallery is Lake George Arts Project Courthouse Gallery, Old County Courthouse 1 Amherst Street, Lake George, New York 12845. Here is a link to the specifics of my show. Stay tuned more photos tomorrow. 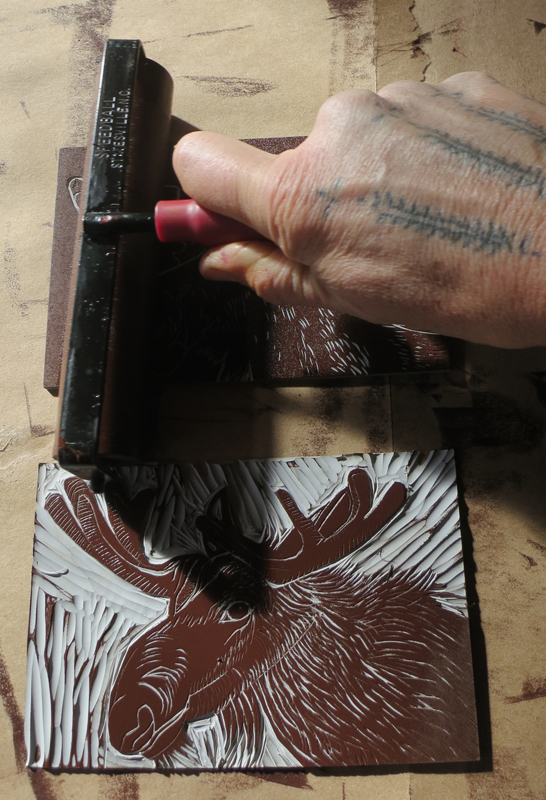 Finally after more than a month of carving it looks like the moose linocut is ready for a trial printing. I would love to get this baby on the press but I have one problem, I am not suppose to put any weight, at all, on my foot. Two weeks ago today I broke my foot in a race, and, boy has that made life a little less exciting. 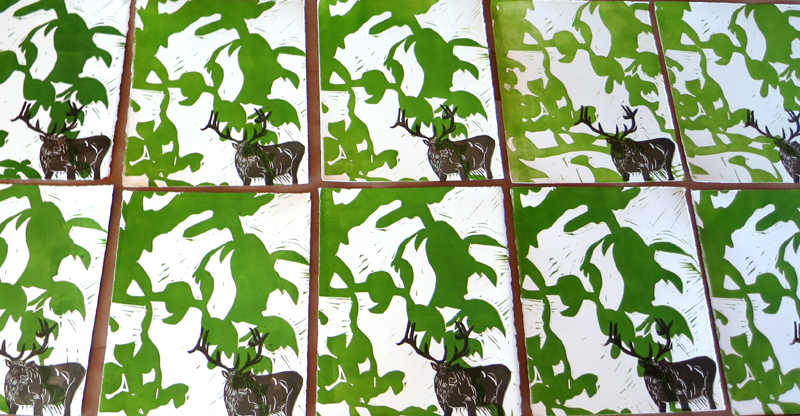 But fear not, even if I can’t print I can still carve, collage, and paint. 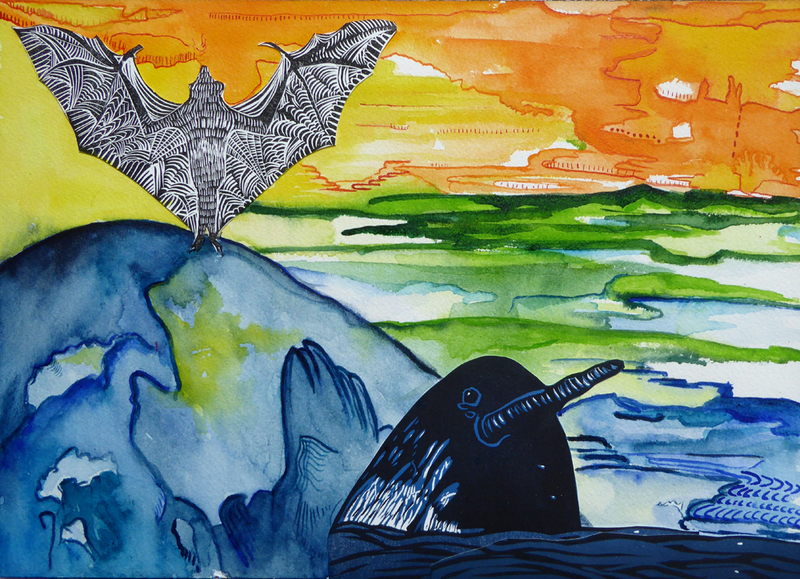 In fact I just finished the “Narwhal World” today. I don’t know if I will keep that title but that is what I am currently calling it. I also went to FedEx and shipped four pieces to the Lake George Art Projects for the exhibition, Art@the Lake. If you are in upstate New York from July 1 through July 27th, come and see the exhibition. It also serves as the annual gallery benefit with over 70 artists. This is going to be a terrific and I am sure you can find some great art to take home. Lastly, I am making a new personal 30 day challenge of a watercolor/ print collage a day, details on the project will follow in a couple days. I don’t know where else you would see an Elk but in the wilderness, and then only if you are lucky. 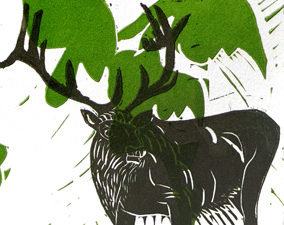 But unless one of my dear followers suggestions a catchier title, “Elk in the Wilderness” will be it. This 10″ x 8″ two color print is now on my Etsy store! Today was a pretty remarkable day. 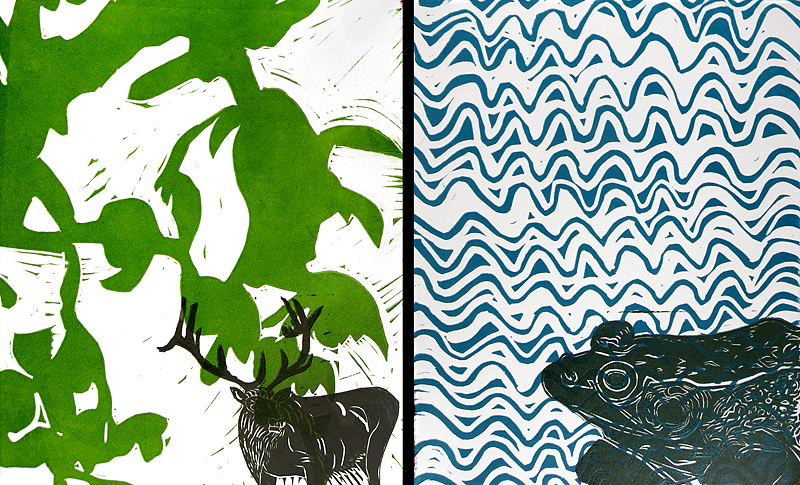 I am glad I took the day off yesterday so that I could not only offer you two prints today, but two two color prints at that! Both are on StoneTrigger Press Etsy store now. 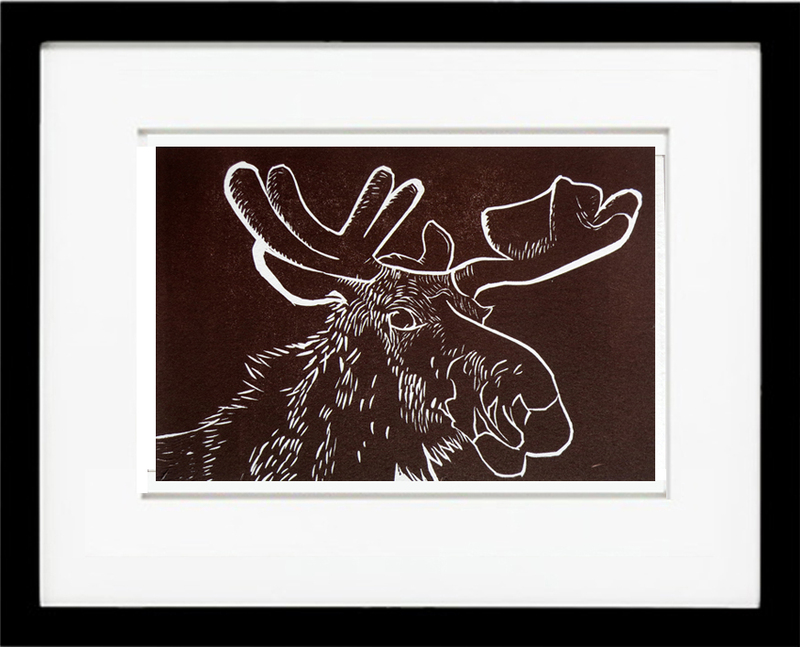 And as always, one print a day, alway 8″ x 10″, always $20 and always made by me with love. It is entertaining insult, though I can’t quite imagine anyone over the age of 10 calling someone a mooseface. 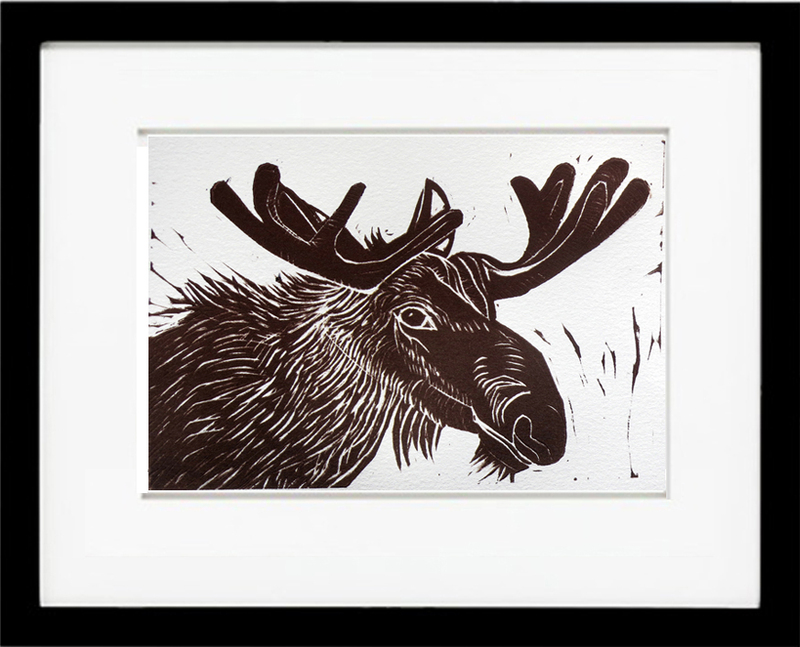 I really like the face of a moose, the overside, kind of dopey look. I have never seen one during my hikes, there are apparently about 50,000 in the Northeast. 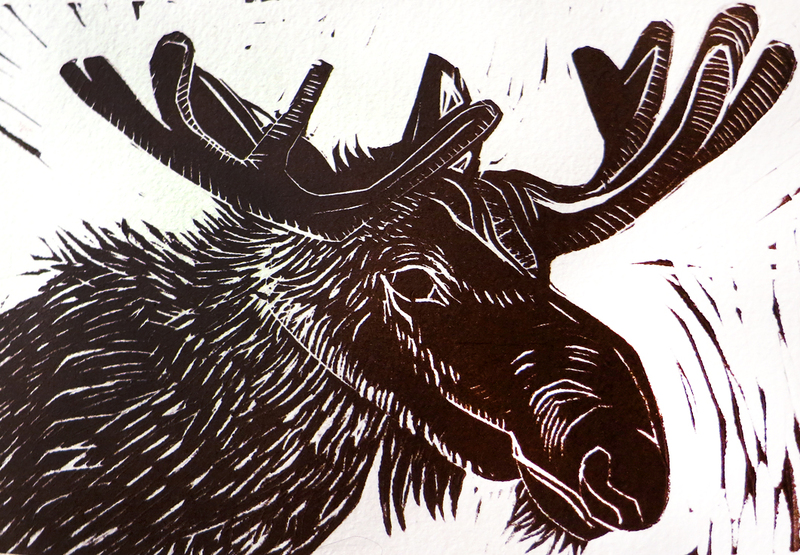 With some luck on my next hike in the Adirondacks of northern NY or higher up in Maine if I print this moose onto my shirt I will conjure one up. 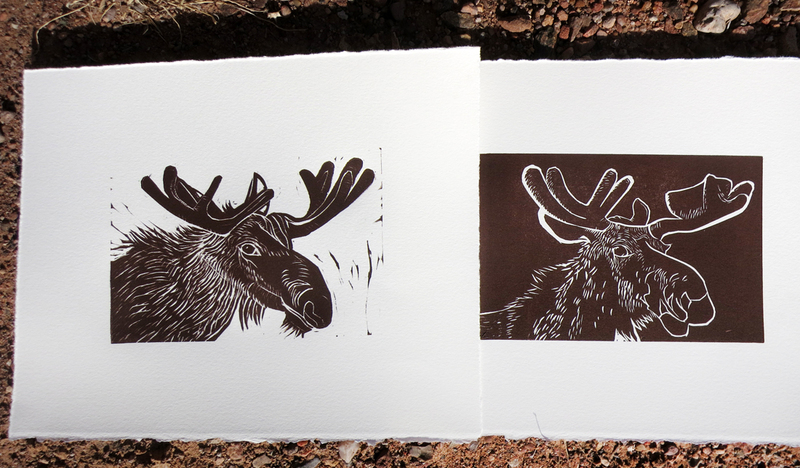 Today you get moose, print #7 and print #8. Both are happy moose! As always they are available for $20 on my Etsy store, they are 4″ x 6″ images on 8″ x 10″ paper and only 10 are available. 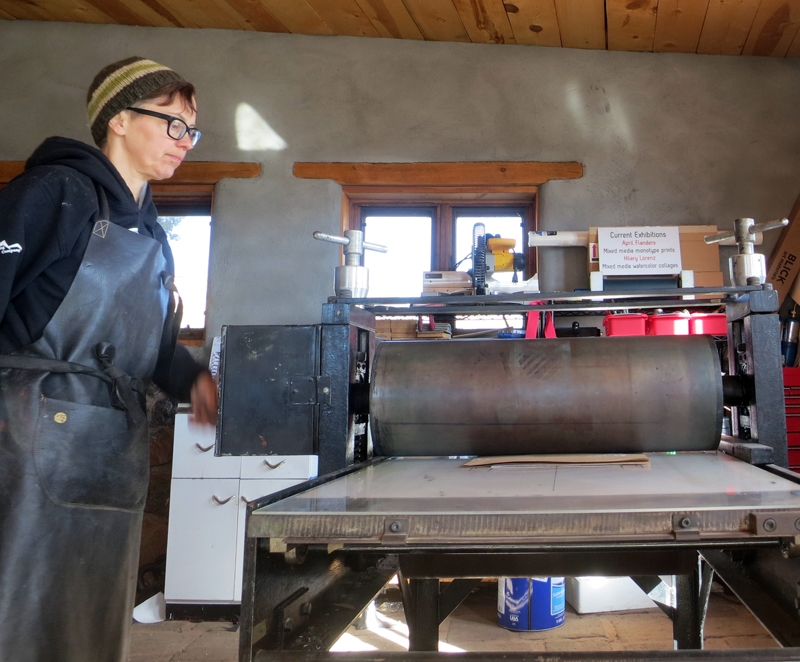 And finally here are two photos, one of me inking the plates and the other printing on my Charles Brand Etching Press. Winter Inspiration in the Adirondacks. 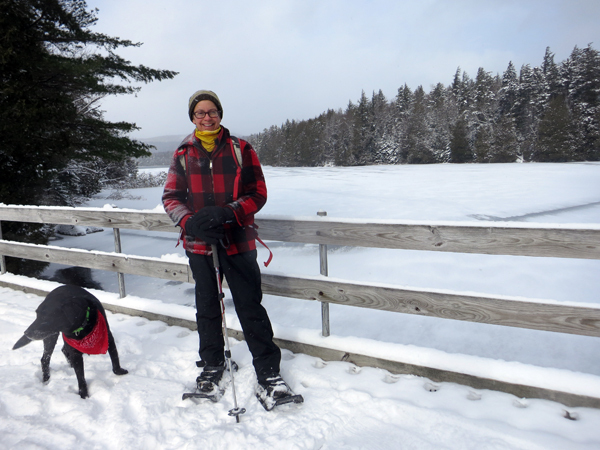 Hilary Lorenz with Homer at Santanoni Preserve, Newcomb, NY. Happy Thanksgiving from the Adirondacks! I spent a delightful day with Nancy, my favorite hiking buddy. What better to do when the temperature drops to 19 degrees than snowshoe the 10 miles of gentle trails in the Santanoni Preserve, In addition to our snowshoe day, I have done more running and walking in the past week than I did all month! I am building up some great inspiration to begin the artwork for my exhibition at the Lake George Arts Project, Courthouse Gallery next November 2015. You know what that means? Many trips to this magically beautiful landscape.